Stella Weston is stuck in a job which she barely tolerates, with a boss who makes things even more difficult. When she is pushed too far, Stella quits her job on the spot, without thinking it through and this leads to some life changing events, not all for the better. Her marriage is hanging on by a thread, money is tight and the future looks bleak. Luckily, she has some wonderful friends: Lizzie, an eternally singleton with a penchant for Marlboros and booze, and Al, a fabulous Gay who loves his two "fag hags" dearly. With her friends help, she discovers that she has the power to change her life and to have fun while doing so! This book is about friendship more than anything else. It shows the reader that anything is possible if you have the support of loved ones and while bad times are almost inevitable, good ones can come close behind. The characters of Al and Lizzie are just amazing and I would gladly have them in my life, anyday! Stella's Mum appears every now and again and, with her misunderstanding of phrases and her complete technophobia, she is so much fun. Stella has a love of baking and there are plenty of descriptions of her creations, which makes the novel not ideal to read on an empty stomach....be warned! Just like a good sponge, this book is light, fluffy and full of sweetness. It even has some yummy recipes included at the end, which readers can try out for themselves. 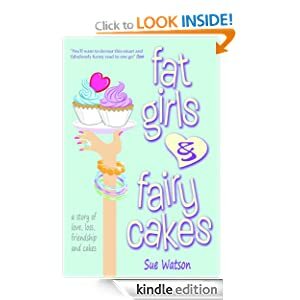 "Fat Girls and Fairy Cakes" is published by Rickshaw Publishing and is available in paperback and e-book format.